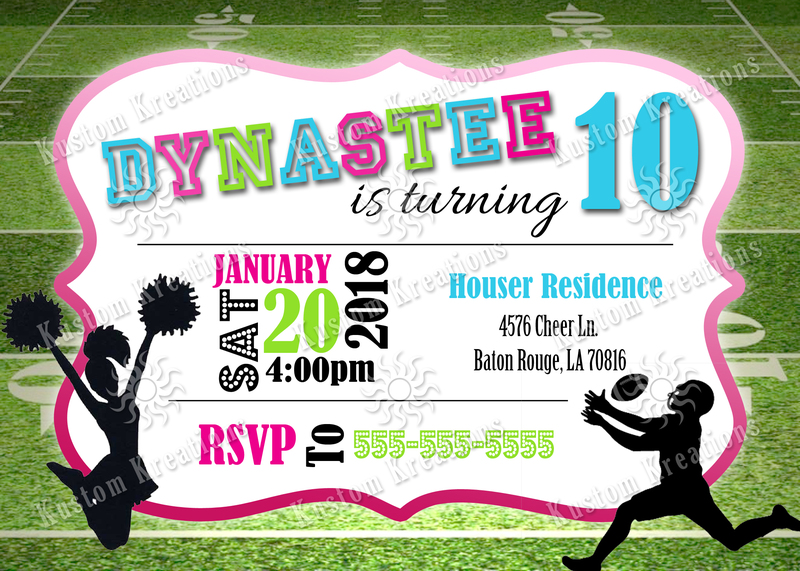 This listing is for a personalized birthday invitation. Great for your child’s party! You will receive a digital picture file so you can print as many as you need. Digital files that are available include: jpeg, gif, png, and BMP. Please specify which file format you prefer during checkout (If not specified will be JPEG). 1. Click the “Buy Now” link and it will send you to PayPal. 3. After the purchase is made it will send you to an order form on my website where you enter the design details( if you entered the details in PayPal note to seller you don’t need to fill out the order form). 5. Once I receive all information needed I will create the design for you and send you the file and just let me know if you need any changes. File size will be 5×7 inches. If you need a different size, please contact me for a custom listing. Text size can be changed to fit your wording. Please include the text you would like on your invitation. Digital files will be sent through my e-mail. If you would like to have the file sent another way, please message me. There are no refunds for this listing. Digital files will be sent 2-3 business days after all information for the design has been received. If there is a problem with your file, or you would like something changed, please message me and I will send a new file with corrections. I do not own the rights to these images, you are paying for my time that I spent collecting, editing, and reformatting the images for your personal crafting needs.